Taken from Sacred Heart: The Centennial Family Book 1894 – 1994, and ends at 1995. The parish of the Sacred Heart dates from 1894 and it was the second Catholic parish established in the city of Norfolk, Virginia. It took 104 years since the days of Abbe Dubois, who came to Norfolk in 1791, for the city to need another parish. Rev. Francis X. McCarthy was the founding pastor. He led the parish in the construction of the first church on the northwest corner of York and Dunmore Streets on property purchased from the Ward Estate for the sum of $2300. The round stained-glass window that was once over the altar of that first church is now in the stairway of the church offices on Graydon Avenue. Father Thomas J. Wilson and Father R. A. Drake served as pastors before Father Thomas E. Waters came to Sacred Heart in 1912. 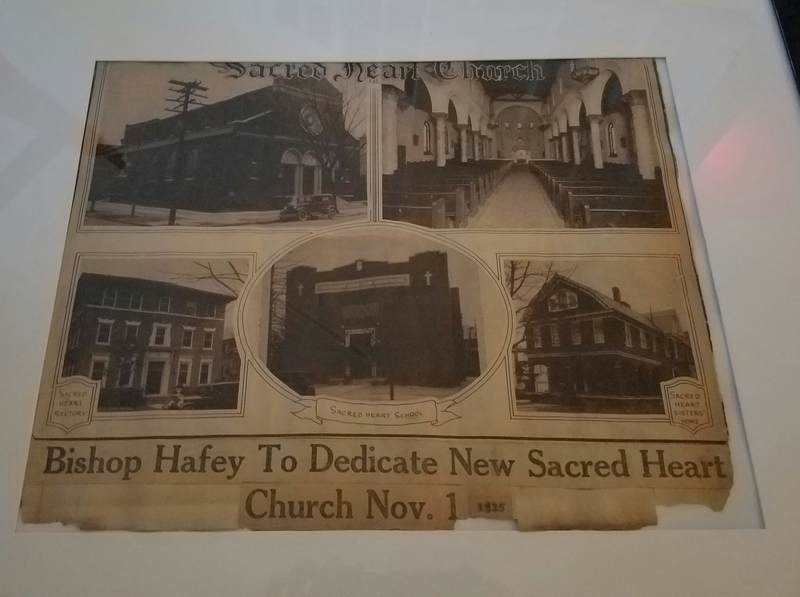 He would serve the parish for 25 years as its pastor and assume responsibility for the opening of Sacred Heart grade school in 1920 and the building of the new Sacred Heart Church in 1925. Father Waters invited the Daughters of Charity from Emmitsburg, Md. to teach in the new school and 180 students were enrolled in grades one through eight that first year. Sister Ariana was principal and taught sixth, seventh, and eighth grades that year. Sister Ariana also trained the altar boys to serve Mass. Sister Catherine taught the fourth and fifth grades at the beginning of the school term until Sister Editha came. Sister Sylvia taught the second and third grades and Sister Bernadine, the first. However, Sister Editha, the newest Sister, was forced to stop teaching because of ill health and Sister Mary replaced her. The first graduates of Sacred Heart School, according to school records, were Margaret Britt, Julia Forrest, Anita Cofer, Olive Borden, and Margaret Stevenson. Interestingly, Olive Borden went to Hollywood and became a movie actress. Father Waters, assisted by the Ways and Means committee chaired by H. D. Oliver, with John F Lawler, Sr., vice-chairman and Frank A. Evans, secretary, oversaw the construction of the new church. The building, designed by Peebles and Ferguson, Norfolk architects, is Florentine Renaissance style. The craftsmanship in the church is superb. Italian marble workers constructed the altars and carved the statues from Carrara marble. Outstanding features of the structure are the classic columns and arches as well as the open woodwork in the ceiling with its scrollwork on the beams. The Midmer-Losh pipe organ was built in 1927. The stained glass windows were made by Franz Mayer & Co. of Munich, Germany. For their installation, the company sent a craftsman to spend a year to oversee the process. Father Waters asked Joseph and Julia Kaufmann to welcome the craftsman into their home for the duration since they spoke German and he would feel at home with them. Daily, Margaret Kaufmann, in the second grade, would bring him his lunch at the building site. The church was dedicated on November 1, 1925, on All Saints Day by Bishop William Hafey of Raleigh, N. Q, who filled in for Bishop Denis J. O’Connell, the ailing Bishop of Richmond. The three priests who were native sons of the parish served as celebrant, Father E. W. Johnston; deacon, Father Julian Bulloch; and sub-deacon, Father Vincent Ryan. On February 5, 1930, Father Waters was honored by being named a monsignor. A distinguished delegation of monsignors and priests joined the parish to celebrate his ministry. Bishop Andrew J. Brennan praised Father Waters for his tireless efforts in overseeing the construction of Sacred Heart’s new church, school, and rectory. Monsignor Waters died on July 1,1937. The white marble bas-relief which stands in the vestibule of the church names him “Beloved Pastor”-an appropriate title for one who so served the Sacred Heart community. While Monsignor Waters was ill and during the time before Father Edward Kilgalen arrived in October as the parish’s fifth pastor, Father Paul Heller was first assistant at Sacred Heart. Father Heller, who spent 14 years at Sacred Heart as assistant, was also instrumental in the establishment of St. Mary’s Infant Home. Father Kilgalen served as pastor during the Second World War. His ministry was to lead the prayers for peace, to help the congregation grow in hope, and to comfort those families that lost sons and fathers in the war. Those who gave their lives are still remembered with love and gratitude: Albert E. Kaufmann, James E. Roche, Frederick P. Downing, Chauncey R. Wheat, Eugene Grille, James V Daugherty, John S. Fantone, George R. Zirnheld, Mars Lewis, Michael Glennon, and Valentine B. Lawless. After Father Kilgalen died in September of 1945, Father E. W. Johnston, a native son of the parish, succeeded him. In 1949, Father Johnston celebrated his 25th anniversary as a priest with a special Mass and a parish reception in the school hall. It was Father Johnston who had the church redecorated in pastel green. By 1953, Father Johnston had become so ill he requested a transfer to a pastorate at St. Vincent’s Church, Berkley Springs, WV. Rev. Thomas J. Walsh succeeded Father Johnston that year. Father Walsh was responsible for a high-quality refinishing of the interior of the church. The floor of the aisles was done in Travertine marble imported from Italy. The pews were stripped of their black paint and bleached so that the grain of the original oak could be seen. Mr. E. Caligari brought in his expert painters to embellish the sanctuary in the blue and gold colors of the traditional decorative design in Florentine churches. Father Waters also had Mr. Caligari create the marbleized effect on the walls of the sanctuary. Father Walsh died a day after President John F Kennedy was shot and the parishioners of Sacred Heart mourned both with funeral masses. Bishop John J. Russell was in Rome attending the second session of the Second Vatican Council at the time; so Monsignor Carroll T. Dozier, Dean of Tidewater and pastor of Christ the King parish, sang the solemn requiem Mass. Father Joseph L. Leitch followed Father Walsh as pastor. He would be pastor during the chaotic, yet exciting years following Vatican II. He and his assistant pastor, Father Thomas J. Quinlan, stressed education, lay leadership, and ecumenism. The parish invited speakers of national renown, organized Bible studies, and built a permanent library to replace the portable one which had been a project of the Sodality. Mrs. A. E Marino, Helen Butler, and Mary Lou Langhorne catalogued more than 600 volumes. Father Leitch, with Father Quinlan at his side, presided over the first Parish Advisory Board meeting on December 11, 1966. Every denomination in the Ghent area was invited to Sacred Heart to hear a representative panel discuss our similarities rather than our differences. The congregation of Temple Beth El came to our school hall to celebrate our common origin. A Mass “in plain English” in the Melkite Rite was celebrated with great interest and joy. The church was centrally air conditioned during this period. Father Paul T. Gaughan would follow Father Leitch in 1968. During his pastorate, the parish subsidy to the school was greatly reduced. The parish population was feeling the effects of the abandonment of Ghent for Virginia Beach and the decline in the area. Father Gaughan encouraged and realized the establishment of a fully elected Parish Council to help implement the directives of Vatican II. The Sacrament of Baptism was celebrated at Mass for the first time on May 9, 1971. Father Gaughan had been director of Catholic Family and Children’s Service, now Catholic Charities, immediately before coming to Sacred Heart. His successor, Father Thomas J. Cassidy, also came to the pastorate of Sacred Heart directly from the Catholic Family and Children’s Service. 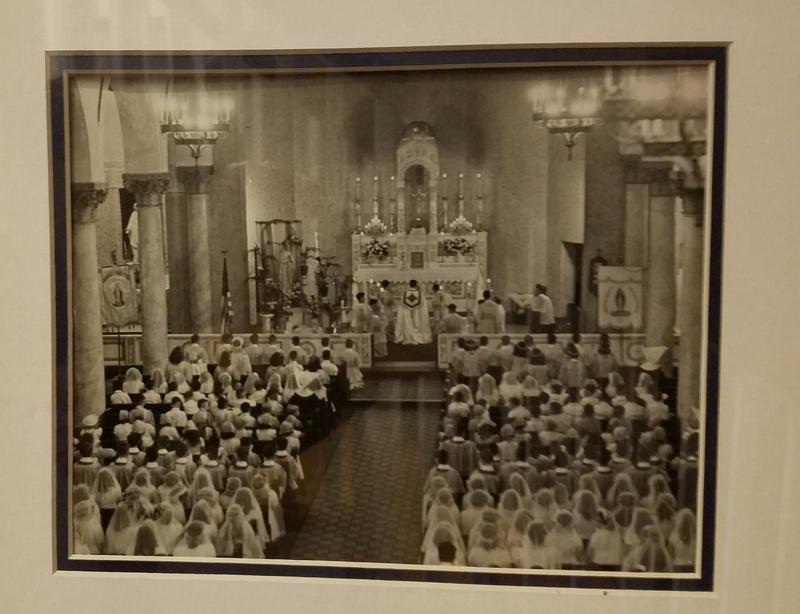 A momentous event of Father Cassidy’s pastorate was the ordination to the priesthood of Robert McGovern on December 4, 1972, by the Most Reverend John J. Russell, Bishop of Richmond. This was the first ordination to take place in Sacred Heart Church. The parish was given the task of planning the ceremony and celebrating the event with a grand party. Because Father Cassidy included the parish in carrying off the whole affair, the parish gained greatly from the experience. Father Raymond A. Barton followed Father Cassidy as pastor in 1973. He was the first to expand the staff to include a Director of Religious Education when he hired Sister Maureen Milnamow, a Sister for Christian Community. He endeared himself to the parishioners of Sacred Heart, especially for the planning for the 50th anniversary of the church and the 80th anniversary of the parish on May 11, 1974. This celebration was not enough to preserve the parish school from closure. The parish population was not growing and the school was dependent on students from outside the parish to keep up the enrollment. In the 1974-75 school year, 81 children who were members of the parish attended. Then in late January the Daughters of Charity announced that they would not be staffing Sacred Heart School after June 1975. All this necessitated a decision by the Parish Council to suspend operations of the school. This decision was most difficult, caused much consternation, and tried the mettle of the whole parish community. It was with great sadness that the parish said goodbye to the sisters. Father Barton challenged the community to grow in ways of bringing a total and effective religious formation program to all the members of the parish. Father Barton left the parish in September 1977 to become a founding co-pastor of the new Anglican-Roman Catholic parish of the Holy Apostles, and Father Jim Forwalk became the new pastor. It was during his pastorate that the vacant school was rented to St. Mary’s parish because of its need for more classroom space. St. Mary’s used the school building for the fifth, sixth, seventh and eighth grades. Father Vincent G. Connery served as pastor for eight years beginning in 1979. The parish doubled in size during his tenure and embraced enthusiastically the Renew Program. It was he who encouraged parishioners to bake the bread for the Eucharist and who invited Ken Janosko to fabricate the large, festive Paschal candle. Ken makes and decorates the Paschal candle annually. Father Connery took on the monumental task of leading the congregation to understand and accept the need for renovation of the church sanctuary, and for building of a commons area between the church and the parish office building. When he left the parish, the final plans had been accepted and the funds had been substantially raised. With all the plans completed for the renovation of the church and the construction of the commons, Father John J. Dorgan succeeded Father Connery as pastor in 1987. It fell to him to oversee the actual construction. That project began with the groundbreaking in February 1988. From June until October, the community’s worship was celebrated on Saturday evenings and Sunday at 8 a.m. at H. D. Oliver Funeral Apartments on Colonial Avenue and on Sunday mornings at 10 a.m. at Maury High School. Bill Tamm, Dan Anglim, and Ken Morris worked very hard to assure the quality of the construction. William M. Jordan Co. did the work with a degree of professionalism that was outstanding. Tom Glisson of Rambusch Studios, New York City, served as the liturgical consultant whose expertise saw to the effective blending of the old and the new. Rambusch Studios designed the lighting, the altar, the ambo, and the baptismal font. Just as in the refinishing which was done in the ’50s, the parish called on the company of E. Caligari and Son to do the painting and stenciling. Once again they did an outstanding job. Mike Chronik refinished and rewired every chandelier in the church in memory of his wife, Joan, who ministered with love to the people of Sacred Heart in so many ways. During this time, Sr. Mary Joan Kentz, of the Sisters of Notre Dame de Namur, was pastoral associate, and through her ministry to children with AIDS she developed a whole program for those children and their families. CANDII Children’s AIDS Network grew to become a fully independent ministry supported by the whole community. The parish celebrated its centennial in 1994. Through speakers, retreats, potluck dinners, a grand homecoming party in April, and a special Mass with Bishop Sullivan in June, the parish returned thanks for 100 years of faith. As 1995 begins, the Columbia Organ Works Co of Columbia, Pa is refurbishing the organ in the church. The console is being replaced and 15 ranks of pipes are being added. Also, the Rev. Hugh C. White, the rector of St. Paul’s Episcopal Church in downtown Norfolk, has restored each the 14 Stations of the Cross, which were imported from Italy in 1926. As the parish begins its second century, it looks forward to continuing to share the faith in life-giving ways. Excerpts used with permission from Norfolk, VA: The Sunrise City by the Sea. By Amy Waters Yarsinske, The Donning Company, Publishers, 1994.